Montana writer Norman Maclean, in his 1976 novel A River Runs Through It, was nostalgic for locally brewed beer as he'd experienced it in the 1930s. He'd be delighted to know that in 2016, depending on who's doing the fishing, Montana beers are now as plentiful as trout in some waters. From left to right, Montana Brewing Company's Czech "Chilsner," Angry Hank's Microbrewery's Head Trauma IPA, Canyon Creek Brewing's ONS Blonde and Uberbrew's White Noise Hefeweizen are a few of the beers brewed just in Billings. All told, there will be about 70 breweries across the state of Montana by the end of 2016. The hop tower at Kroger's Brewery in Philipsburg was built in 1890. Philipsburg Brewing Co. of Philipsburg now operates a modern craft brewery on the same location. Courtesy of Philipsburg Brewing Co. They are a father and his two grown sons fishing the Blackfoot River in Montana, a place untouched by man except for the presence of beer and trout fishing tackle – Eden with fly shops and breweries. So when one of those sons writes a book based on his family’s experience decades later, he cannot help feeling nostalgic for that year, 1937, and that beer they left cooling at the cold stone toe of mountains. Once? Norman Maclean can be forgiven for that note of despair about a golden age that is gone forever. He died in 1990, 14 years after A River Runs Through It was published and before a local brewery movement had worked Montana into a ferment. But what a difference a few decades makes. In the Montana of 2016, 40 years after Maclean’s novel appeared, there’s no need for nostalgia – the good old days of local breweries are right now, not 1937. And forget about 10,000 as some sort of marker for the population that can sustain a brewery. What a wonderful world it is in 2016 when even in Wibaux, Montana, population 400, people can drink beer brewed locally at Beaver Creek Brewery. In Philipsburg, population 800, there are two breweries – both owned by the Philipsburg Brewing Co., the brewery whose Rope Swing Saison won Best of Show, Best of Montana and Best Saison at the 24th Annual Garden City BrewFest in Missoula in May. It’s a show that had 70 beers competing. And at the 2016 New York International Beer Competition, Big Hole Brewing Co. of Bozeman – going head to head with 400 beers and ciders from 12 countries – won two bronze medals for its “hand-built” ales and was also named Montana Brewery of the Year. Good beers are found all over Montana these days; and some use local ingredients that go beyond malt and wheat and barley. Nationwide data from 2015 from the national Brewers Association said that Montana had 6.5 breweries for every 100,000 people ages 21 or older, more per capita than any other states except Vermont, Oregon and Colorado, which ranked 1, 2 and 3, respectively. For comparison’s sake, those data show that Vermont had 9.4 breweries per 100,000 people, Oregon had 7.7 and Colorado had 7.3. But Matt Leow of the Montana Brewers Association notes that those figures come from a point in time at which Montana had 49 craft breweries. There are now 64 that are in operation, Leow said, and counting six more that are in the works, Montana could have 70 craft breweries by year’s end. That might call for some shuffling of figures in assessing Montana’s breweries-to-population rank among the states. What happened was that Montana, too, felt the pinch of the nation’s gnawing appetite for local foods, a “gastronomical movement” that included beer as well as all kinds of foods. That’s how founder and brewer Travis Peterson of Meadowlark Brewing of Sidney sees it. Peterson says breweries understand the local appeal and include it in their marketing, often giving their breweries names rooted in the local landscape or – in Meadowlark Brewing’s case – using a name that relates in some other way to the landscape. The western meadowlark is the state bird of Montana. “I wanted people to have that connection with our place,” Peterson said. Jeff Dafoe, founder of Big Hole Brewing, agreed that something new is going on. Dafoe, too, sees local breweries as an outgrowth of the local foods movement. Whether they’re roasting coffee beans locally or baking artisan breads or brewing Montana beers, those artisans are pioneering a new sector of the economy that values craftsmanship, he suggested. Dafoe, for one, thinks local breweries have charted a course for other enterprises. And, adds Peterson, they’re making original brews. Meadowlark Brewing has made 18 different beers so far during its four-year history, he notes, including ingredients that range from candy cap mushrooms to squash. “We grow the squash out at my mom and dad’s house,” Peterson said. But the craft beer movement is about more than the beer. It’s about the brewery or the brew pub as a meeting place – sometimes a destination. “People’s tastes are changing, but it’s also becoming a community hangout,” said Leow. In little Wibaux, for example, Beaver Creek Brewing simply adds one more reason to drive over from, say, Glendive, 28 miles west along Interstate 94. 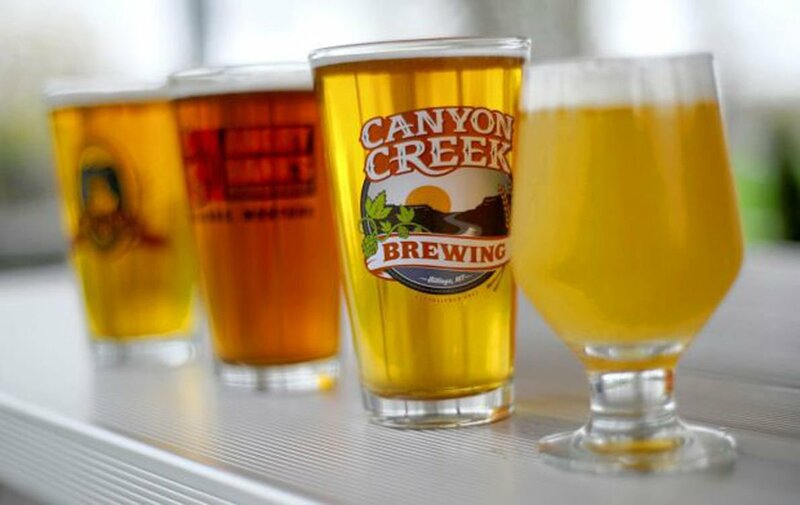 But, he adds, only 30 percent of Beaver Creek’s beer is consumed on site. The company ships about 70 percent of its beer to distributors in an area from Bozeman to Bismarck. Cathy Smith, one of the owners of Philipsburg Brewing Co., said people also enjoy the ambience and “personality” of the breweries – each one serves up its own heady brew of history, charm and quirkiness. One of her company’s two breweries in Philipsburg, for example, has its foundations firmly planted in local history. “Charles Kroger started a brewery here that ran until Prohibition. Only the large breweries survived Prohibition,” Smith said. Charles Kroger was born in Holstein, Germany, on Nov 5, 1832, and later came to America. The federal Census of 1870 found Charles Kroger in Beartown, Montana Territory, with $2,000 in assets; he was working as a brewer. In August 1875 he launched his Kroger Brewery in Philipsburg and sold beer under the name Silver Spray. Kroger served at different times as Philipsburg mayor, as an alderman, as a school trustee, and as master of the local Masonic Lodge. Philipsburg Brewing Co. started once again brewing and bottling beer at the original site of Kroger’s brewery in August 2015 – 140 years later. Water from Camp Creek is still used today for the brewing process; the brewery also uses water from a spring on the site. Charles Kroger and his wife planted a tree every time they had a child, three of the trees are still on site, as is the hop tower, where the brewery would dry the hops for the beer making. In addition, the brewer’s house still stands on the side of the new brewery. At Missouri Breaks Brewing in Wolf Point, Montana, a community of about 2,800 people, manager Marianne Zilkoski Rees said the local brewery movement doesn’t tap into a new trend so much as it taps an old, old preference for quality. “I think the world had always been interested in good food and drink,” she told Montana Magazine in an email. “Craft beers, certainly from the perspective of craft brewers, offer a more distinct and flavorful alternative to the same old same old. “Local” is a two-way street, she added. The company buys locally when it has to make repairs, for example. And local, she added, has reach. All politics, they say, is local. In a wonderful, perfect world, all beer is local, too.